Tulsa faces Kansas City in the opening round of the Kelly Cup Playoffs, starting Thursday and Sunday at the BOK Center. 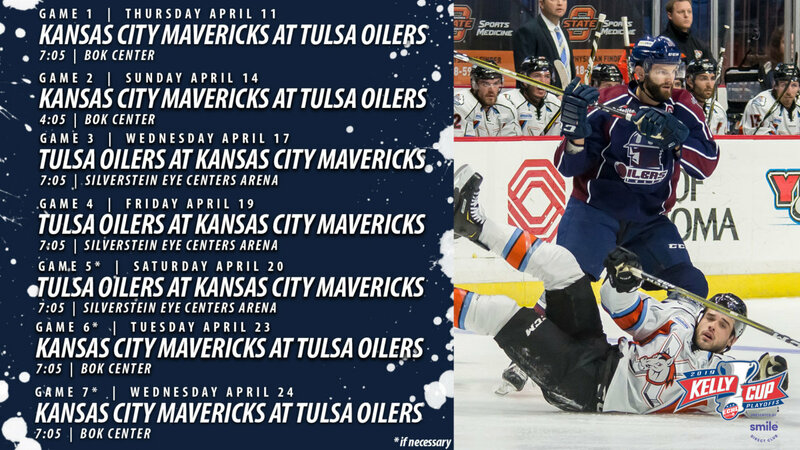 TULSA, OK– The Tulsa Oilers, proud ECHL affiliate of the National Hockey League’s St. Louis Blues, announced the full schedule Monday for the team’s first round playoff series against the Kansas City Mavericks in the Kelly Cup Playoffs, presented by SmileDirectClub. Tulsa’s playoff roster will be revealed later today. The Oilers, regular season champions of the Mountain Division have home ice advantage in the best-of-seven series, starting Thursday at 7:05pm at Tulsa’s BOK Center. If the team advances past the first round, the Oilers would have home ice advantage again for the Mountain Division Finals, with that schedule to be announced at a later date. Season ticket holders can pick up their playoff tickets at the Tulsa Oilers front office, located at 9128 E. 46thSt, Tulsa, OK 74145, during the week from 9am-5pm.